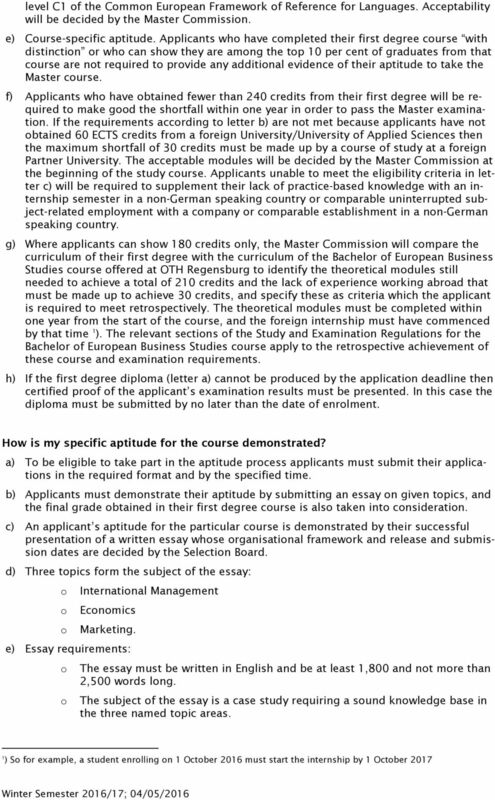 Download "FAQs for the Master of European Business Studies (MEB) course"
3 o The essay must be completed within 48 hours from the time it is set. It must be submitted online to the Faculty of Business Studies before the end of the allotted time. o Authors must indicate the sources and references they have used. They must enclose a form certifying that the essay is entirely their own work. All submitted essays will undergo a plagiarism check so please observe the relevant standards governing scientific working methods! f) Points will be awarded based on the results of the essay and the final grade of the applicant s first degree. A maximum of 100 points can be obtained. A minimum of 65 points are needed to pass the aptitude test. o A maximum of 70 points are awarded for the essay: 30 points for the International Management section 30 points for the Economics section, and 10 points for the Marketing section o A maximum of 30 points are awarded for the grade of the applicant s first degree: 0 points for a grade points for a grade point is awarded for each tenth better than a grade 4.0 If the first degree was obtained abroad, the grades will be converted according to Section 6(6) of the General Examination Regulations. For reasons of non-discrimination we are unable to answer any advance queries from applicants about the aptitude assessment process. You will find essential information about the aptitude assessment in the information leaflet on course applications. Information is also provided online on the course pages: If I send in my CV and existing certificates can you tell me whether I ll be admitted to the course? No. Documents submitted in advance cannot be checked for completeness and accuracy. I did not study in Europe so how do I know if the points I gained from my home university are worth at least 180 ECTS credits? You can usually reckon that a first degree course lasting 3 years is worth 180 ECTS credits. The course s total workload must also be taken into account, so for example if your course had a workload of 5,400 hours (lectures plus self-directed study) then this is equivalent to 180 ECTS credits. Remember that you must produce the relevant certificates and other documentation. Our course admissions board will not be able to verify your documents if they do not clearly show the required data (workload, course length etc. ), and you may be excluded from the application procedure if there is any doubt. 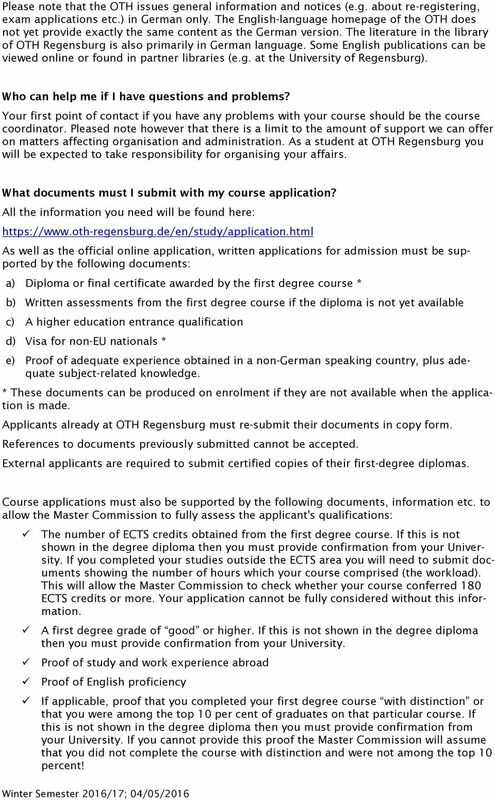 Remember that your evidence confirming the course length and/or number of ECTS credits obtained must be submitted in German or English language. If you do not yet have any documents available in German or English you will need to request them from the institution where you took your first degree. Confirmations from that institution in English or German will be accepted as proof. Please note that you must submit these documents in addition to your regular degree documents (certificate, diploma). 4 If you fail to provide this documentary evidence and the Master Commission cannot establish how many ECTS credits you obtained in your first degree course, your application cannot be considered any further. I did not study in Europe so how do I know if my degree grade is good or better? Foreign grades are converted using the so-called modified Bavarian formula : x = (Nmax Nd)/Nmax Nmin) x = required grade Nmax = best attainable grade in the foreign grading system Nmin = lowest grade needed for a pass in the foreign grading system Nd = your own grade, i.e. the grade to be converted to the German grading system If you get a value of 2.5 for x it means that your degree grade is equivalent to a good or better. 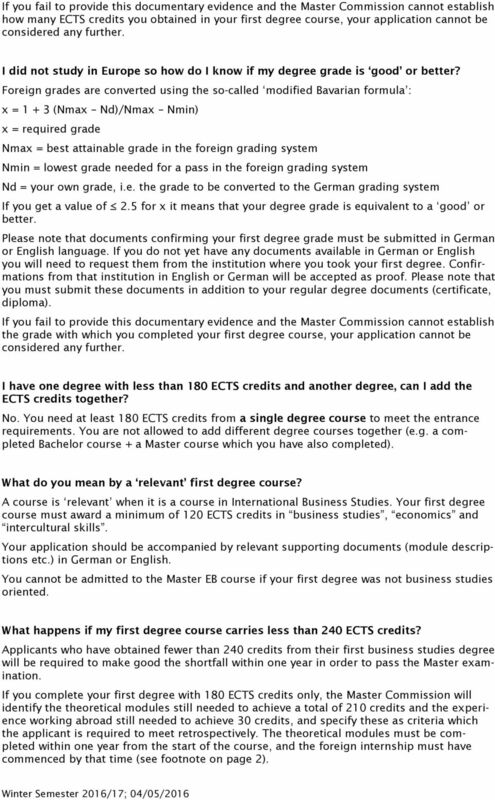 Please note that documents confirming your first degree grade must be submitted in German or English language. If you do not yet have any documents available in German or English you will need to request them from the institution where you took your first degree. Confirmations from that institution in English or German will be accepted as proof. Please note that you must submit these documents in addition to your regular degree documents (certificate, diploma). If you fail to provide this documentary evidence and the Master Commission cannot establish the grade with which you completed your first degree course, your application cannot be considered any further. I have one degree with less than 180 ECTS credits and another degree, can I add the ECTS credits together? No. You need at least 180 ECTS credits from a single degree course to meet the entrance requirements. You are not allowed to add different degree courses together (e.g. a completed Bachelor course + a Master course which you have also completed). What do you mean by a relevant first degree course? A course is relevant when it is a course in International Business Studies. Your first degree course must award a minimum of 120 ECTS credits in business studies, economics and intercultural skills. Your application should be accompanied by relevant supporting documents (module descriptions etc.) in German or English. 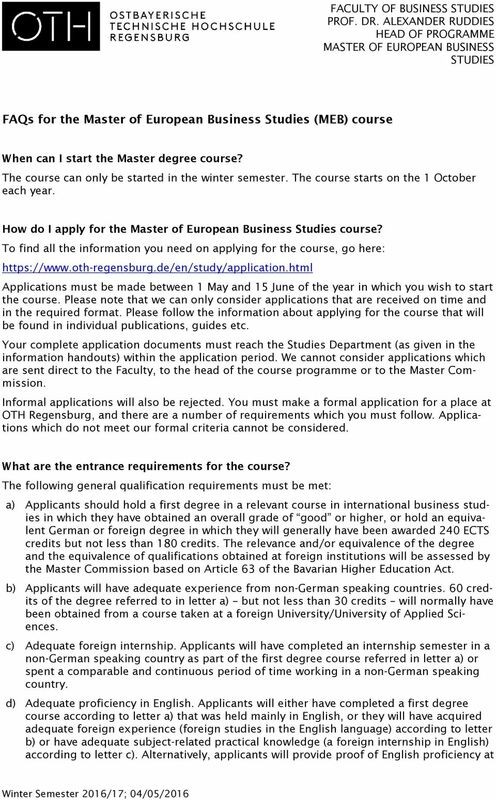 You cannot be admitted to the Master EB course if your first degree was not business studies oriented. What happens if my first degree course carries less than 240 ECTS credits? Applicants who have obtained fewer than 240 credits from their first business studies degree will be required to make good the shortfall within one year in order to pass the Master examination. 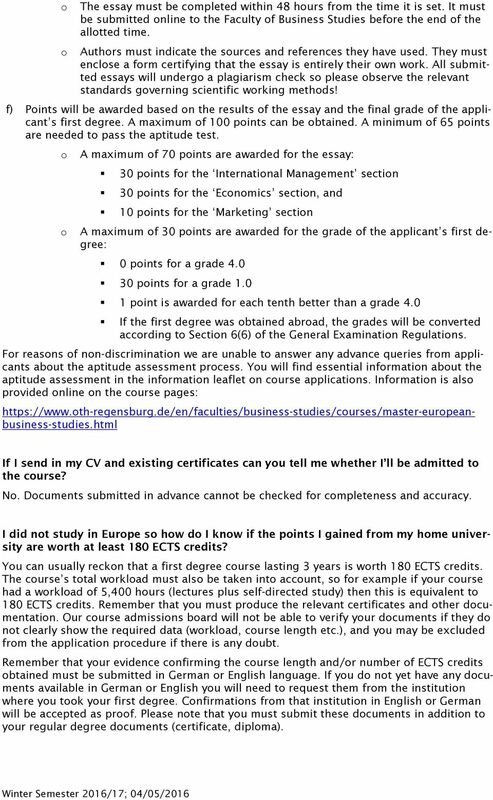 If you complete your first degree with 180 ECTS credits only, the Master Commission will identify the theoretical modules still needed to achieve a total of 210 credits and the experience working abroad still needed to achieve 30 credits, and specify these as criteria which the applicant is required to meet retrospectively. The theoretical modules must be completed within one year from the start of the course, and the foreign internship must have commenced by that time (see footnote on page 2). 5 Can extensive practical experience in employment compensate for a first degree with less than 180 ECTS credits or a grade below good? No, applicants must meet the eligibility criteria to be admitted to the course. Practical experience cannot be a substitute for failure to meet one or more of the criteria. What happens if I haven t completed a study course abroad? If you haven t obtained 60 ECTS credits at a foreign University/University of Applied Sciences then the maximum shortfall of 30 credits must be made up in a course at a foreign Partner University while you are enrolled in our Master degree course. The Master Commission will grant you conditional acceptance in this case. You must have at least 30 credits from a foreign course. 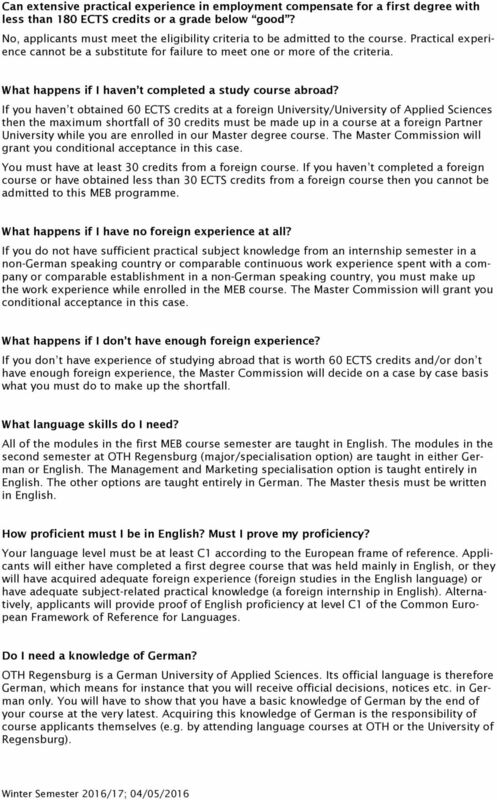 If you haven t completed a foreign course or have obtained less than 30 ECTS credits from a foreign course then you cannot be admitted to this MEB programme. What happens if I have no foreign experience at all? If you do not have sufficient practical subject knowledge from an internship semester in a non-german speaking country or comparable continuous work experience spent with a company or comparable establishment in a non-german speaking country, you must make up the work experience while enrolled in the MEB course. The Master Commission will grant you conditional acceptance in this case. What happens if I don t have enough foreign experience? If you don t have experience of studying abroad that is worth 60 ECTS credits and/or don t have enough foreign experience, the Master Commission will decide on a case by case basis what you must do to make up the shortfall. What language skills do I need? All of the modules in the first MEB course semester are taught in English. 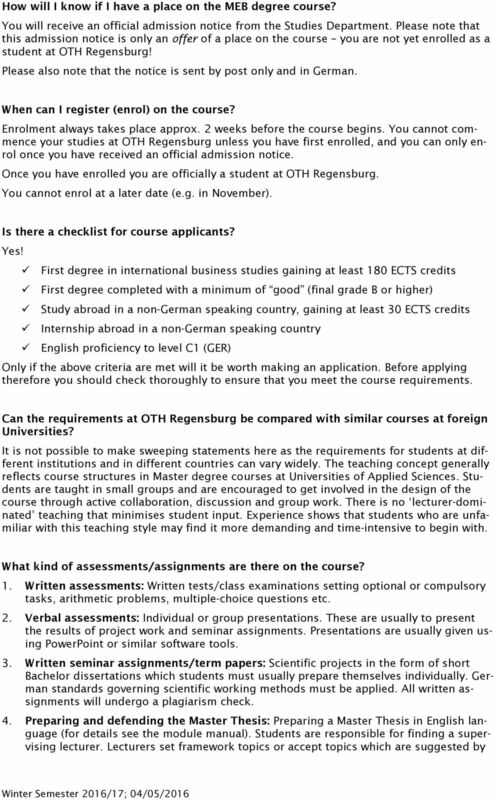 The modules in the second semester at OTH Regensburg (major/specialisation option) are taught in either German or English. The Management and Marketing specialisation option is taught entirely in English. The other options are taught entirely in German. The Master thesis must be written in English. How proficient must I be in English? Must I prove my proficiency? Your language level must be at least C1 according to the European frame of reference. Applicants will either have completed a first degree course that was held mainly in English, or they will have acquired adequate foreign experience (foreign studies in the English language) or have adequate subject-related practical knowledge (a foreign internship in English). Alternatively, applicants will provide proof of English proficiency at level C1 of the Common European Framework of Reference for Languages. Do I need a knowledge of German? OTH Regensburg is a German University of Applied Sciences. Its official language is therefore German, which means for instance that you will receive official decisions, notices etc. in German only. You will have to show that you have a basic knowledge of German by the end of your course at the very latest. Acquiring this knowledge of German is the responsibility of course applicants themselves (e.g. by attending language courses at OTH or the University of Regensburg). 6 Please note that the OTH issues general information and notices (e.g. about re-registering, exam applications etc.) in German only. The English-language homepage of the OTH does not yet provide exactly the same content as the German version. The literature in the library of OTH Regensburg is also primarily in German language. Some English publications can be viewed online or found in partner libraries (e.g. at the University of Regensburg). Who can help me if I have questions and problems? Your first point of contact if you have any problems with your course should be the course coordinator. Pleased note however that there is a limit to the amount of support we can offer on matters affecting organisation and administration. 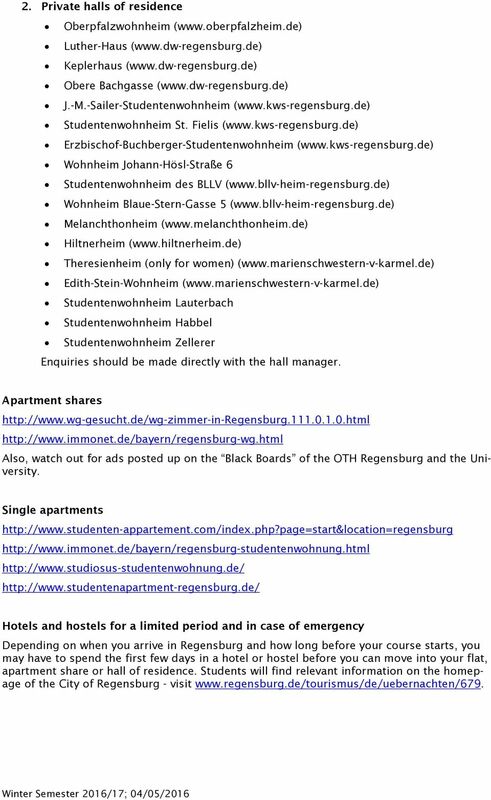 As a student at OTH Regensburg you will be expected to take responsibility for organising your affairs. What documents must I submit with my course application? All the information you need will be found here: As well as the official online application, written applications for admission must be supported by the following documents: a) Diploma or final certificate awarded by the first degree course * b) Written assessments from the first degree course if the diploma is not yet available c) A higher education entrance qualification d) Visa for non-eu nationals * e) Proof of adequate experience obtained in a non-german speaking country, plus adequate subject-related knowledge. * These documents can be produced on enrolment if they are not available when the application is made. Applicants already at OTH Regensburg must re-submit their documents in copy form. References to documents previously submitted cannot be accepted. External applicants are required to submit certified copies of their first-degree diplomas. Course applications must also be supported by the following documents, information etc. to allow the Master Commission to fully assess the applicant's qualifications: The number of ECTS credits obtained from the first degree course. If this is not shown in the degree diploma then you must provide confirmation from your University. If you completed your studies outside the ECTS area you will need to submit documents showing the number of hours which your course comprised (the workload). This will allow the Master Commission to check whether your course conferred 180 ECTS credits or more. Your application cannot be fully considered without this information. A first degree grade of good or higher. If this is not shown in the degree diploma then you must provide confirmation from your University. Proof of study and work experience abroad Proof of English proficiency If applicable, proof that you completed your first degree course with distinction or that you were among the top 10 per cent of graduates on that particular course. If this is not shown in the degree diploma then you must provide confirmation from your University. If you cannot provide this proof the Master Commission will assume that you did not complete the course with distinction and were not among the top 10 percent! 7 Your application cannot be considered if it is not submitted on time and in the required format, and you will receive an automatic rejection because of a lack of documents. How many semesters does the Master EB course last? The standard course length is 2 semesters. If you have received a conditional acceptance, then the course will take longer. Can I take the whole course in English only? Yes, that s possible. The modules in the first semester are taught entirely in English. The modules in the Management and Marketing specialisation option are also taught entirely in English. The other specialisation options are taught in German. However, you can study your specialisation at a foreign University/University of Applied Sciences (as a so-called freemover ) and so choose a language area that suits you. The Master Thesis must be written in English. 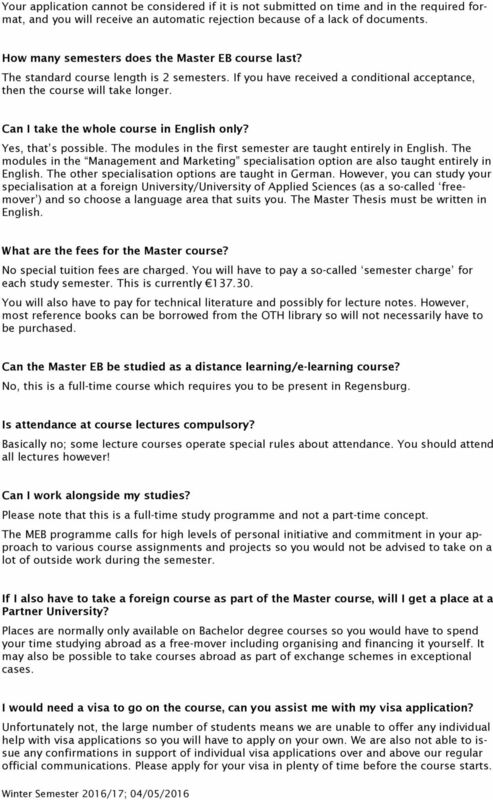 What are the fees for the Master course? No special tuition fees are charged. You will have to pay a so-called semester charge for each study semester. This is currently You will also have to pay for technical literature and possibly for lecture notes. However, most reference books can be borrowed from the OTH library so will not necessarily have to be purchased. Can the Master EB be studied as a distance learning/e-learning course? No, this is a full-time course which requires you to be present in Regensburg. Is attendance at course lectures compulsory? Basically no; some lecture courses operate special rules about attendance. You should attend all lectures however! Can I work alongside my studies? Please note that this is a full-time study programme and not a part-time concept. The MEB programme calls for high levels of personal initiative and commitment in your approach to various course assignments and projects so you would not be advised to take on a lot of outside work during the semester. If I also have to take a foreign course as part of the Master course, will I get a place at a Partner University? Places are normally only available on Bachelor degree courses so you would have to spend your time studying abroad as a free-mover including organising and financing it yourself. It may also be possible to take courses abroad as part of exchange schemes in exceptional cases. I would need a visa to go on the course, can you assist me with my visa application? Unfortunately not, the large number of students means we are unable to offer any individual help with visa applications so you will have to apply on your own. We are also not able to issue any confirmations in support of individual visa applications over and above our regular official communications. Please apply for your visa in plenty of time before the course starts. 9 the students themselves. The topic of the Master Thesis should reflect the student s chosen specialisation area. Can the Master Thesis also be written in conjunction with a business enterprise? Yes, this is possible in principle but identifying a suitable company will be the responsibility of students themselves. The Faculty cannot provide any help here and has no capacity to support students in their applications to businesses. You will find offers for final year theses for example on the Job Exchange of the Bavarian Universities of Applied Sciences at: The OTH Regensburg Career Service ( can help students with the application process (e.g. checking their application portfolios, application training etc.). Can the Faculty or OTH Regensburg help me find a job? Sorry no. It is not the responsibility of the OTH to help students look for work so if you want a spare time job you will need to organise this yourself. The following is a list of some of the websites with job offers: There are many other similar job exchanges for students. 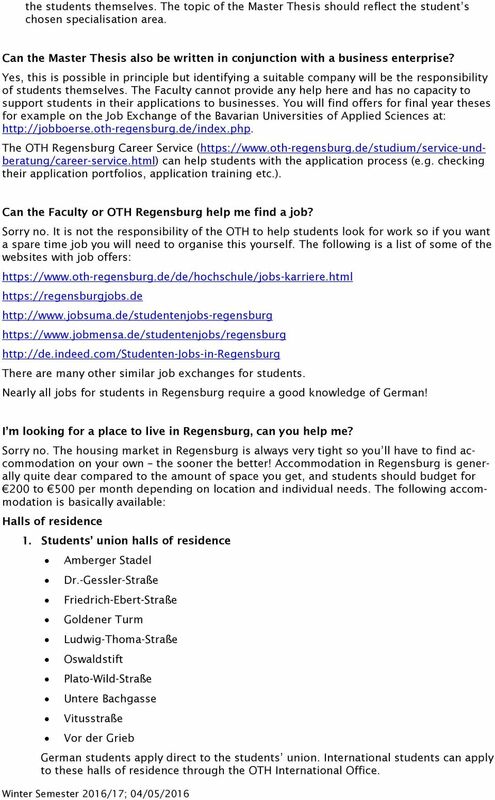 Nearly all jobs for students in Regensburg require a good knowledge of German! I m looking for a place to live in Regensburg, can you help me? Sorry no. The housing market in Regensburg is always very tight so you ll have to find accommodation on your own the sooner the better! Accommodation in Regensburg is generally quite dear compared to the amount of space you get, and students should budget for 200 to 500 per month depending on location and individual needs. The following accommodation is basically available: Halls of residence 1. Students union halls of residence Amberger Stadel Dr.-Gessler-Straße Friedrich-Ebert-Straße Goldener Turm Ludwig-Thoma-Straße Oswaldstift Plato-Wild-Straße Untere Bachgasse Vitusstraße Vor der Grieb German students apply direct to the students union. International students can apply to these halls of residence through the OTH International Office. studies and internships included in the degrees are specified in the curriculum guide. provided by the schools in their capacity as service providers. Regulations governing the terms of admission and selection for the consecutive Master s programme Crop Protection. I. Scope. Campus Center Alsterterrasse 1, 20354 Hamburg, www.uni-hamburg.de/campuscenter Information for international applicants (bachelor degrees) Thank you for your interest in studying at Universität Hamburg! Master Program International Automotive Engineering Master Program Automotive Production Engineering Dear Applicant, thank you for your interest in our Master-Programs "International Automotive Engineering"